Sen. Kirsten Gillibrand has taken a major step toward announcing a presidential bid, saying she is launching an exploratory committee for a White House run. Congratulations to Senator Gillibrand upon her announcement to run for president in 2020. The only question is, which Gillibrand is running? 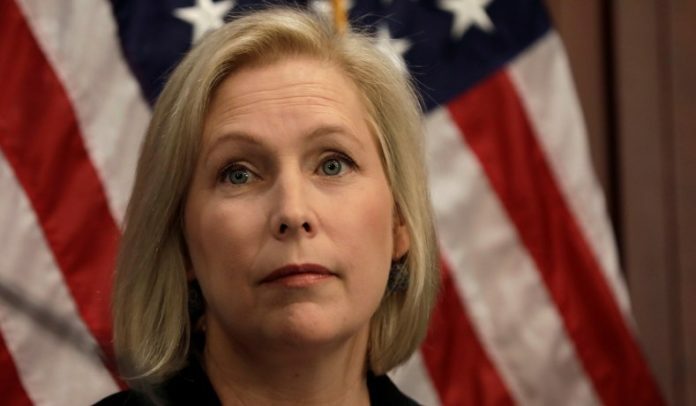 “There’s likely no other candidate seeking the Democratic Party’s nomination that has been less consistent or a bigger flip-flopper than Senator Gillibrand,” says former Democrat assemblyman from New York and chairman of the Coalition for a Positive America, Dov Hikind. Consider the following facts of her voting record and public statements: as a candidate for Congress running in Hudson Valley, N.Y. she was considered (by herself and colleagues) to be a ‘moderate to conservative’ legislator. As a newly-elected Democrat from N.Y. she joined the conservative caucus called the Blue Dog Coalition, bragging that her voting record was “one of the most conservative in the state.” She even campaigned against granting amnesty to illegal immigrants. Fast-forward to today where she was one of the first and loudest to declare “abolish ICE!” That’s not the only issue she’s flip-flopped so radically on. As a congresswoman from upstate New York, she was all pro-gun and had an A-rating from the NRA. She even told Newsday in February of 2009 that she “kept two rifles under her bed.” Despite having been gung-ho on guns just years ago, she has now joined the far-Left in seeking some of the most restrictive gun legislation ever proposed. In all fairness, Gillibrand, like every politician, has a right to change her positions; she’s even stated publicly that all of her old positions were outright wrong, and her newly adopted positions are the correct ones. But what accounts for this complete about-face? What happened? Was there some late-night epiphany with the sky parting and a voice calling out to her? Did she have a religious awakening? Was it a dream? Or does she suffer from political amnesia? Gillibrand has plans to travel to the leadoff caucus state of Iowa later this week. The more time she spends away from her base here in NY, the less damage she can inflict upon we New Yorker’s. Hopefully she’ll go the same way her predecessor Hillary went, fading into the oblivion.